Want to “swap stories”? 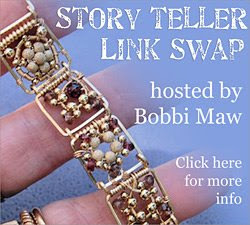 Join the Story Teller Link Swap on JewelryLessons.com…..
Eni suggested this wonderfully fun challenge, and I jumped at the offer to host it. Each participant would make 4 links – embellish them anyway you like. Each participant would then send them to me. As they arrive to me, I will list your names in the order the packages are post-marked. When all the links are in, I will add my 4 links, and mail them all back to the first person on the list. Each artist will take out 4 different links, and mail them on to the next person on the list enclosed. I will be last on the list. I chose to do only 4 links to help keep the cost down, both in making the links, and the postage to send them. If there are enough participants, I will send them out in groups of 10 or 12 to a list to shorten the travel time. When you get your links from 4 of your fellow artists, complete the bracelet with links to compliment the one’s you’ve chosen, and show off the finished piece in the gallery. This is a fun challenge to share and exchange links with your fellow artists. Everyone is encouraged to participate regardless of skill level or country you live in. If you wish to participate, please read over the guidelines and post a comment to this article that you wish to join in, and I will PM you my mailing address. *Each participant will create 4 links; you can use square or round wire in either Gold Filled, Sterling Silver, Brass, or Copper – no craft wire, or artistic wire please. *Embellish your links using any of the tutorial suggestions below, or create your own like Rita’s (Puppette3) cute little Bonsai trees. *Please keep your link sizes to 1/2 inch square, so they fit nicely with other artists links. *Send your links no later than April 15, 2009; the sooner you send them the closer to the beginning of the list you’ll be. *Each participant is encouraged to post a picture of the links they are sending in the gallery. Then update the project with the completed bracelet. *Please take 1 link from 4 different artists, not all from the same artist. Not a member of Jewelry Lessons??? Come join us – Registration is free…….